What are we not doing while so many of our movement's resources are being used for unproductive internal arguments? Southall Black Sisters demonstrate for migrant women's access to public funds in cases of domestic abuse. Credit: SBS. When The Spectator published Julie Burchill’s ‘Don’t you dare tell me to check my privilege’ in 2014 it was yet another salvo in the ongoing conflict around inclusion and diversity on both sides of the Atlantic. These discussions take place in all movements but they have recently taken particular prominence in online feminism. Social media doesn't start these conversations, it amplifies them. Tweets and online articles feed each other and create increasing polarisation and conflict. Feminists are occupied by seemingly endless, frustrating cycles of accusation, defensiveness and recriminations. These have an attendant drag on our motivations for continued engagement. But this is a politics of representation, a process of looking at who speaks for whom about what. Our attention needs to move towards a politics of change: re-visioning a shared future and working towards its realisation through activism. In doing so, we may also open up more fruitful arenas for discussion. Being part of a movement can be exhilarating. After isolated years of being the only one who thought a certain way, I found the relief of working with others who felt the same way incredible. However, when women further marginalised by other structures of power struggle for their priorities to be taken seriously and mechanisms for dealing with challenges do not work, this causes ruptures. Multiple movements have struggled to deal with these tensions. A lot of the conflict in the feminist movement has focused on a word. Originally elaborated by academic Kimberle Crenshaw, intersectionality simply describes the truth that experiences depend on all aspects of a person’s identity rather than just one. All women are not the same. Sexism, racism, transphobia, homophobia, class privilege, immigration status, geographical location and other forms of dominance and oppression do not operate independently but are inherently interconnected. For example, black women in abusive relationships have to deal with racism and patriarchy. They may be unwilling to report their partners, knowing black men are disproportionately targeted by the state, due to the racial profiling inherent in the wars on terror, drugs and crime. They also (increasingly) face a lack of services that centre race and gender and deal with other relevant issues, like the application of immigration law and policy. Assertions that using the word “intersectionality” is elitist and inaccessible for working class women have been met with counter assertions that this position is inherently condescending. The defenders of intersectionality point out that a movement that so easily learnt, adopted and internalised the word patriarchy is applying a double standard. In this way, the use of a word becomes a political position activists take. Attacks on intersectionality as a word are taken as covert attacks on the analysis and action it requires. After years of trying to expand horizons to centre the lives of women like those we know, this can feel like a complete rejection of our efforts and ourselves from the movement. This is also why there is such a strong reaction when a journalist writes an article about feminism without mentioning one black woman. We view this as the white dominated movement (again) not taking the contributions and realities of black women seriously. Similar processes are at play when feminists make transphobic comments, organise events in non-accessible venues or without facilities for those who are deaf or focus on “power feminism” without realising this is likely to exclude women from many class backgrounds. On the other hand, those who are challenged are often confused by what they perceive as attacks. They have genuine intentions to work for the rights of women. They have spent a lot of time and energy trying to mobilise, organise and take action. That this is not recognised can be difficult to understand. As human rights activist Jane Barry says: “A betrayal in the activist world is one that cuts the deepest.” Political differences can get very personal very quickly – both in how they are expressed and experienced. Fighting hurts. The emotional pain caused can lead towards the urge for self-preservation through avoidance. Or it can be expressed through striking back to try and engage. There is an obvious need to reconfigure ways of thinking and working: to forge alternative ways forward. Reaching across the divides and focusing on integrating these discussions within collective activism rather than relying on remote conversations may be part of the answer. As I have written elsewhere, the conflict we see in feminism and other movements is not bad. It is a sign of underlying tensions rising to the surface. If dealt with properly, it ensures the dynamism and change we need. The problem is that we continue to deal with tensions in ways that are based on patriarchal, hierarchical, capitalist and adversarial forms of 'problem solving’ and ‘conflict resolution’. These approaches mean one person or side ‘wins’, rather than finding the best way forward for everyone. People talk (or rather tweet, or blog) at each other to make their point. We are not making meaningful attempts to communicate by hearing and responding to what is being said. Most disappointingly, the underlying issues are aired but continue to be unaddressed. There may be more awareness of the word intersectionality among a particular type of (online) feminist but knowledge as to what it means, let alone how to put it into practice, is sorely lacking. Increasing our collective vocabulary alone is not a sign of success. What matters is the impact this has on the movement and through this on wider society as a whole. This is not to say conversations we have been having are not important. They are vital. This is why our collective time and energy has been taken up with them. Dealing with issues of exclusion and marginalisation within movements is not a distraction from ‘our real work'. And everyone needs to make their own decision about where they want to focus the limited amount of time that is left over after being in or looking for employment, studying, and caring for family and friends. It is valid to devote energies to working on the movement. Not enough importance is given to the difficult and unglamorous work of mobilising and movement building. Yet, many of us seem to have decided to prioritise tweeting about writing about talking about theoretical concepts instead. Social media creates a tendency to be sucked away into discussions rather than making conscious decisions to do so. I cannot be the only person to have become engrossed in writing or tweeting only to realise that it is 3am in the morning, I have not done the activist work I planned to do and I have to be up in a few hours. What are we not doing because so many of our resources as a movement are taken up with this? There has not been enough of a coherent, concerted feminist response to closures of violence against women services, the removal of legal aid, the conditions in factories overseas where the clothes and equipment we use are made, attacks on the rights of immigrants, or changes in the benefits system. All of these have serious detrimental impacts on the physical, emotional or financial security of women. Each also reinforces and ossifies gender norms, whether it be that women are less able to leave abusive partners or that the gender pay gap has widened for the first time in five years. We cannot just forge on with seemingly never-ending Twitter debates and hope they will be the solution. Unresolved tension is one of the key reasons why movements disintegrate. People grow increasingly frustrated or disengage to save themselves from emotional pain. What our movements aim to achieve is too important to let this happen. Let us take steps now, ensuring we find ways of connecting and communicating with each other that reflect the society we wish to create; one where we recognise and affirm the humanity of each other, redress imbalances between the powerful and weak and act with genuine intentions. Of course, the destructive rather than constructive nature of these conversations is not without precedent. Leafing through my birth issue of Spare Rib is similar to reading a series of blog posts today. The exact content may have changed but the language, arguments and emotions remain the same. Despite this there has been no concerted effort to find out and learn from the histories of our movements around conflict or to pass on this information. When I ask older feminists about how they found a way past what happened, they tell me it is through working together in activism. 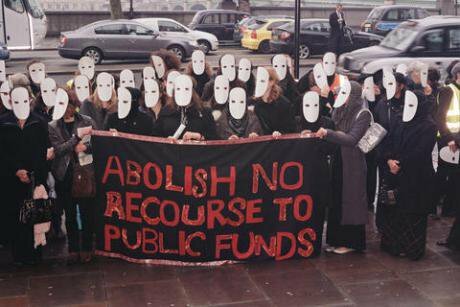 The campaign to abolish no recourse to public funds is just one example of women recognising multiple axes and hierarchies of power and difference and reaching out across them. The campaign brought a core feminist issue (violence against women) together with a cornerstone of anti-racist work (discriminatory treatment of immigrants). It looked at one of the most marginalised and overlooked groups of women, recent immigrants experiencing domestic violence, who had to ‘choose’ between remaining in an abusive marriage or return to countries of origin where they were at risk of stigma and persecution. Almost thirty black feminist, women’s rights and human rights organisations, including Southall Black Sisters, the Women’s Resource Centre and Amnesty International, led the campaign. With the support of allies in parliament and the media, such as Baroness Helena Kennedy QC, they were – partially - successful. They did intersectionality rather than just talking about it. They kept the focus on the legal and social change that was necessary and, in doing so, found ways to circumvent the wahala of so-called ‘identity politics'. Issues of power, exclusion and marginalisation should inform our activism. This has to be in terms of prioritisation of issues, whose realities we address and representation. When we do this, we move towards a more holistic vision of ensuring all are being carried forward by a movement purported to be universal in nature. Enough of paying lip service to concepts like ‘inclusion’, ‘diversity’ and ‘intersectionality’. Let us now focus on doing them in practice.